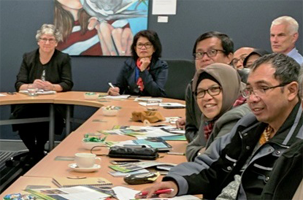 In early August the TRB hosted visiting delegates from three Indonesian teacher training universities. The visit was undertaken as part of their study in the Strategic Leadership Program for Higher Education Executives offered through the Knowledge Exchange International organisation. During the visit the delegates learnt about the functions of the Board and the way it administers the provisions of the Teachers Registration and Standards Act 2004 to regulate the teaching profession in South Australia. This session also provided interesting insight into the differences and similarities between the Indonesian and Australia’s education systems for TRB staff. The Hartley Institute, Blackbird IT and Using Technology Better are holding a free workshop, Getting Started with Apple Teacher which will focus on the Apple Teacher program and the creative process with iPads. On Wednesday 30 August, 3:30pm – 6:00pm at the Hartley Institute, 54 Capper Street, Kent Town. Click here to register. Pedagogically Speaking – Technology for Enhancing Learning, a full day workshop that explores ways which teachers can approach planning and resource selection to make sure they get the best outcome for students. Wednesday 4 October, 9:00am-4:00pm, $165, EDC, Milner Street, Hindmarsh. Designing Digital Thinking: An intro to the Digitech Curriculum, a full day workshop that explores what kinds of thinking and learning the Digital Technologies curriculum demands of teachers and students. Monday 25 September, 9:00am – 4:00pm, $165, EDC, Milner Street ,Hindmarsh. The Australian Council for Health, Physical Education and Recreation SA, in conjunction with the SA Catholic Primary Schools Sports Association, is holding the 2017 Health & Physical Education Primary Years Conference. Monday 25 September. More information here. Sue Larkey presents Understanding Autism Spectrum Disorder with Dr Tony Attwood. Friday 15 September at the Morphetville Racecourse, 9:30am – 3:00pm. Early bird before 12 September, $185, full fee $205. Find out more here. Joanna Buttfield is holding a Making My Classroom Work: Developing Student Organisation, Self-Management and Behaviour to Access Learning Effectively workshop for Special Education and Primary Classroom Teachers. Monday 28 August, 9:00am-3:30pm at The Highway, 290 Anzac Highway, Plympton, $140. For more information and to register click here. Professor Donna Cross is holding a student wellbeing and resilience workshop, Strengths, Needs and Opportunities: A Holistic Approach to Pastoral Care. Monday 11 September, 9:00am-3:30pm at The Highway, 290 Anzac Highway, Plympton, $140. For more information and to register click here. PLD Literacy & Learning present Literacy & Learning in the Foundation Years at the State Library of SA, 9:00am-3:00pm Tuesday 12 September. More information here. The International Boys Schools Coalition Regional Conference (Asia Pacific) is being hosted at Prince Alfred College on Thursday 14 & Friday 15 September. The conference theme is “Bucking the trend – What works for boys?” Whilst the conference is focussed on boys’ education, educators from co-educational schools are welcome to attend. Please click here to visit the IBSC conference page. Gowrie SA has released its July – December 2017 professional learning and development guide for teachers and educators working in preschool, early years of school and early childhood education and care settings. To access the guide click here. The Australia and New Zealand Education Law Association together with Finlaysons Lawyers is holding a free seminar for schools, Accommodating and supporting students with disability – best practice to facilitate legal compliance and safety. Thursday 14 September in the Function Room, 12th floor Finlaysons Lawyers, 81 Flinders Street, Adelaide, 5:00pm- 7:00pm, RSVP by 11 September to Tony Houey: thouey@adam.com.au or call 0409 679 102. Mental Health in Education Summit, Monday 4 - Wednesday 6 September at the Grace Hotel, 77 York Street, Sydney. Find out more here.